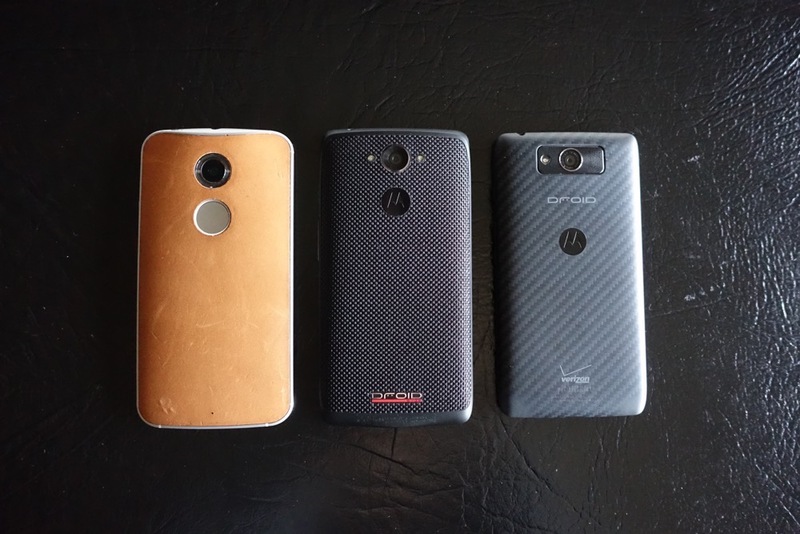 With the unboxing and hands-on gallery out of the way, we wanted to put the brand new DROID Turbo up against last year’s DROID MAXX, to see how far we have come, but also against the still-mostly-new Moto X (2nd gen), to see the leap Motorola made in just a couple of months. As you may recall, Motorola took some flack last year with the new DROID line and original Moto X for using what most considered to be sub-standard specs. That is not the case at all this year. The Turbo tops almost every other phone on the market in terms of specs, from its Quad HD display to its Snapdragon 805 processor to its 3GB RAM and 21MP camera. The Turbo is a beast on paper. When you compare the Turbo to the MAXX, there are so many differences. Versus the MAXX, the Turbo has a slightly bigger (5.2″ vs. 5.0″) and higher resolution display (QHD v. 720p), better processor (Snapdragon 805 vs. Snapdragon S4 Pro), upgraded camera (21MP vs. 10MP), bigger battery (3,900mAh vs. 3,500mAh), and more RAM (3GB vs. 2GB). If you put the Turbo up against the new Moto X, which was just released in September, it also comes close to putting it to shame. The Turbo has a newer and more powerful processor/GPU combo, higher resolution display, bigger battery, more RAM, and a higher MP camera. In the video below, we dive into not only spec comparisons of the three phones, but also how they look next to each other.